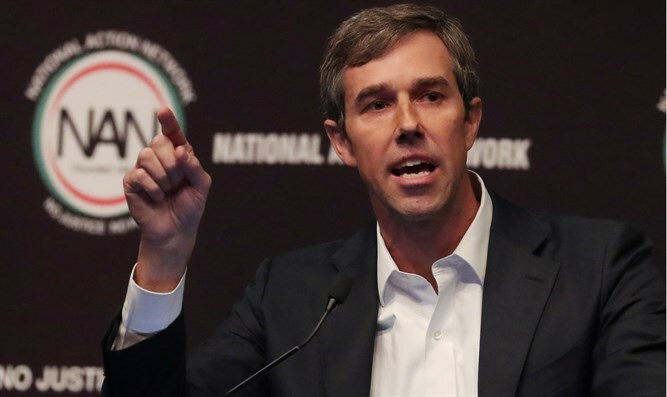 Former Texas Rep. Beto O’Rourke, who is seeking the Democratic presidential nomination in the 2020 elections, appeared to suggest on Sunday that Prime Minister Binyamin Netanyahu is racist, The Hill reported. Asked in if his criticism of Netanyahu risked alienating supporters of Israel, O’Rourke drew a distinction between support for Israel and support for Netanyahu. “The US-Israel relationship is one of the most important relationships that we have on the planet, and that relationship, if it is successful, must transcend partisanship in the United States, and it must be able to transcend a prime minister who is racist, as he warns against Arabs coming to the polls, who wants to defy any prospect for peace as he threatens to annex the West Bank, and who has sided with a far-right racist party in order to maintain his hold on power,” O’Rourke said, referring to the union between the Jewish Home and Otzma Yehudit parties, which had been brokered by Netanyahu. Netanyahu, O’Rourke asserted, does not represent either the best interests of the US-Israel relationship or a path to peace in the region. “We must be able to transcend his current leadership to make sure that the alliance is strong, that we continue to push for and settle for nothing less than a two-state solution, because that is the best opportunity for peace for the people of Israel and the people of Palestine,” he said, according to The Hill. The comments mark the second time that O’Rourke has taken aim at Netanyahu. Last month he accused the Israeli leader of “openly siding with racists” and using anti-Arab demagoguery in the 2015 Knesset election. Speaking at a campaign event in Keene State College, a liberal arts school in New Hampshire, O’Rourke suggested that Netanyahu could not serve as a negotiating partner for final status talks with the Palestinian Authority (PA), comparing Netanyahu unfavorably with PA chairman Mahmoud Abbas. "Right now we don't have the best negotiating partners on either side,” O’Rourke said during a question-and-answer session at the event. O’Rourke ran against incumbent Republican Texas Senator Ted Cruz in the November midterm elections, but lost. He was a heavy underdog when he challenged Cruz in mostly conservative Texas, but he quickly demonstrated an ability to draw capacity crowds and raise money from voters nationwide. He officially announced he would seek the 2020 Democratic presidential nomination last month, joining a crowded Democratic race. Numerous candidates have already announced their intention to challenge President Donald Trump in the 2020 presidential election, including Senator Elizabeth Warren, Senator Amy Klobuchar, Senator Kamala Harris, Senator Cory Booker, and Senator Bernie Sanders. Former Vice President Joe Biden has not yet announced his candidacy, but many have speculated that he plans to do so.